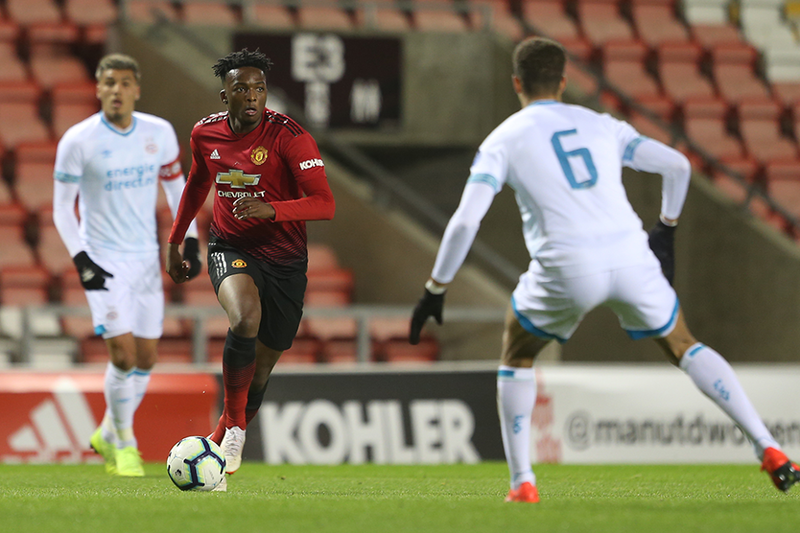 Manchester United have kept alive their hopes of reaching the Premier League International Cup quarter-finals with a 0-0 draw against PSV Eindhoven. PSV forward Mauro Junior caused the home side problems, but twice failed to hit the target. Man Utd's Zak Dearnley had an effort pushed away by Youri Roulax, before Largie Ramazani, making his debut, sent an ambitious effort wide. The stalemate at Leigh Sports Village means United are third in Group F on two points and must win their final group match to go above second-placed PSV, who have four points after playing all three group fixtures. If United beat Paris Saint-Germain by three goals they are guaranteed top spot ahead of leaders Derby County, who are on five points, and a place in the knockout stages. Should they win but finish below Derby on goal difference and goals scored, they could still reach the last eight as one of two best runners-up.